If you’re a person who is interested in training, whether it be training your dog or training in general, I recently finished a book that I recommend you read. 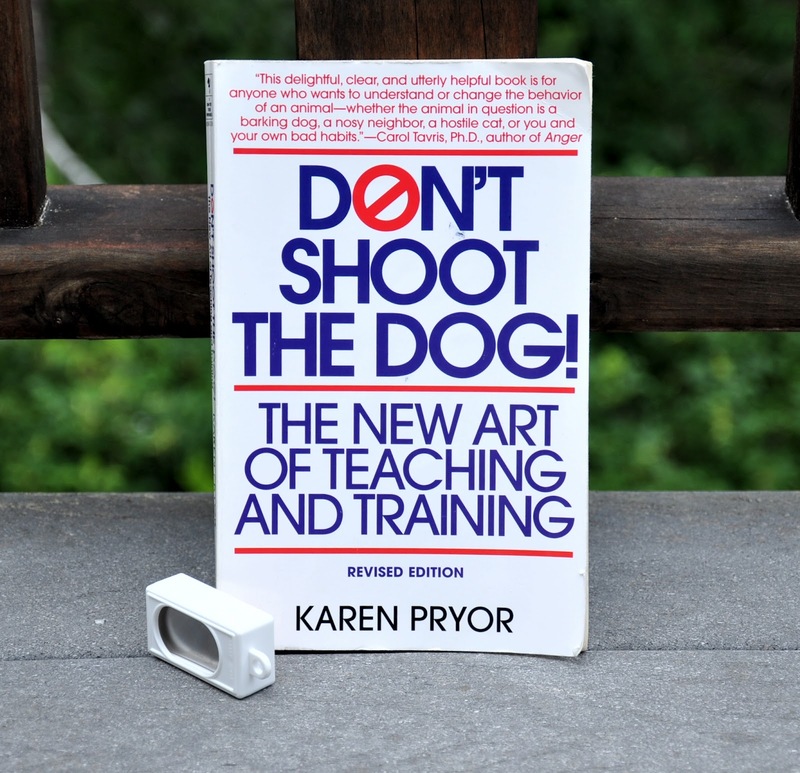 It’s called Don’t Shoot the Dog and is written by former dolphin trainer and clicker-training enthusiast Karen Pryor. You might have heard of the book—it’s been out since 1984 with a revised edition in 1999. If you haven’t read it yet, it’s worth checking out. 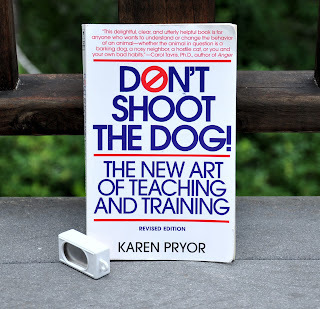 Don’t Shoot the Dog discuses training methods in general, but emphasizes on and argues for positive reinforcement as a more successful training method in most situations. The book also discusses what’s been come to be known as “clicker training” and the methodology behind it. This book is fun as well as informative due to the many interesting examples described. Did you know that you can train just about any animal using positive reinforcement? Dogs, fish, chickens, horses, cats, and even we, ourselves, respond well to this method. Some other interesting things I learned from Don’t Shoot the Dog are that people have been known to improve their own squash game just by positively reinforcing themselves whenever they made a good play, and brushing off instances when they made bad plays. I also learned that you can teach creativity to animals. Positive reinforcement tends to encourage animals to figure out what we want of them, which gets them to think and try new things. I love the idea of fast and effective training methods, but what really got me excited was when I read that animals trained using positive reinforcement tend to be happier. The author gives an example of a police dog that was clicker-trained and now wags his tail the whole time it’s on patrol and out catching “bad guys”. When Leopold was in puppy school his teacher talked of clicker training. Up until I read this book, I dismissed the use of a clicker because I didn’t like the idea of having to always carry around a clicker—it just wouldn’t be possible! This book cleared up that qualm, though, stating that the clicker is only important during the initial training of a behavior. The clicker is basically a tool to help communicate with a dog (or other animal). After the clicker has been “loaded” (you have first teach the dog that the “click” sound means they did something good), it is a very fast and precise way to reinforce your dog’s behavior. And since timing is important to the success of positive reinforcement, the clicker is an ingenious way to maximize both you and your dog’s effort. What exactly is a clicker? It’s a small plastic box w/ a piece of metal inside that makes a loud “click” when you push it. It’s a very simple device and you can pick one up at most pet stores for cheap. You can see one in the photo at the top of this post.